The black cat has made a deep impact in the history of the feline species. The color of these cats has triggered serious and strong emotions in humans throughout history. Unfortunately too many humans have responded with fright to a black colored cat. 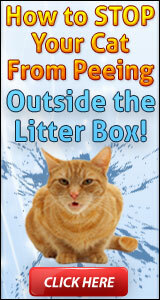 This tragic reaction has resulted in a massive persecution of countless innocent black felines. On mainland Europe black cats were associated with the devil himself during the Middle Ages. The Feast of St. John (June 24rth) was a particularly dangerous time for black cats. Black cats were on this evening rounded up and burnt alive on the bonfire. It was common belief that this was the evening witches from all over Europe had their gathering. It was also common belief that witches could transform themselves into cats. The church encouraged this practice believing black cats were the devil’s helpers. Pope Gregory IX (1147-1241) hated cats and started the feline holocaust that would last almost five hundred years. In a Papal Bull (1233) he condemned the black cat as diabolic and thereby giving his blessing to the torture and killing/burning of cats. Pope Innocent VII (1339-1406) and Pope Innocent VIII (1432-1492) both spoke load and clear giving their blessings to persecution of cats. 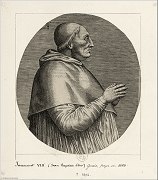 Pope Innocent VIII went out of his way to remind the inquisitors to always burn the cats together with the witches. The only thing that could save a black cat from being burned alive was a white spot no matter how small. A white spot on a black cat was known as the “Angel’s mark” and was the only thing that could save the black cat from the burning flames of fire. Thousands of black cats ended their lives in the flames. There is an account from a physician that King Louis XIII of France (1601-1643) requested to leave in order to spare the lives of the cats to be burned on the bonfires on St. John’s Day. This was duly noted on June 24, 1604, making the king only three years old at the time. The effect of this mission in favor of the black cats seem slim to none. The black cats have a long history of being associated with darkness, witchcraft and even death. 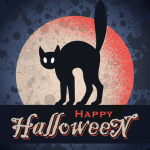 Even today the black cats are among the favorite symbols during the Halloween festivals. 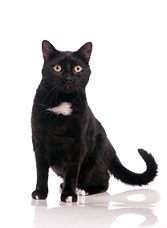 Some superstitious people will consider it bad luck if a black cat crosses their path. This applies mostly to the USA and mainland Europe. A superstitious gambling person certainly does not want to see a black cat crossing their path on the way to a casino. That would definitely bring bad luck and the only wise thing to do would be to avoid the casino on that particular day. In Britain it is the opposite. Black cat crossings your path will bring you luck in Britain. Some tongues say it may be because evil has passed by without harming you. King Charles I of England (1600-1649) had a black cat. He loved his black cat dearly. Stories have been passed down through the generations that the king’s black cat brought good luck. The day after his black cat died, the king was arrested and later beheaded. Ship’s cats have always been considered good luck. A black ship’s cat was considered the best and thought to be extremely lucky. During the 19th century in England sailor’s wives often kept black cats in their homes to ensure a safe voyage at sea for their husbands. Postcards sent during the Second World War often had pictures of a black cat by the seaside wishing the receiver all the best of luck. Greeting card manufactures in England have a history of using pictures of black cats as a good-luck symbol. In Northern England there was a superstition that if an unmarried woman kept a black cat in her home, she would never lack sweethearts. In Scotland the arrival of a strange black cat to your home is said to be a sign of prosperity and obviously a very good omen. Never chase away a black cat from your house. 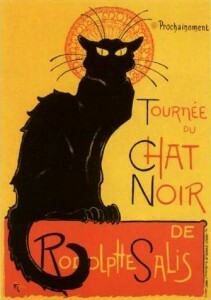 In Paris there was a world famous cabaret theater named “Le Chat Noir” – The Black Cat. It opened in 1881 and unfortunately closed in 1897. In Oslo, Norway there is a cabaret and revue theater named Chat Noir (Black Cat). It was established in 1912. The names Chat Noir and Black Cat have gained popularity for hotels, restaurants and nightclubs worldwide. 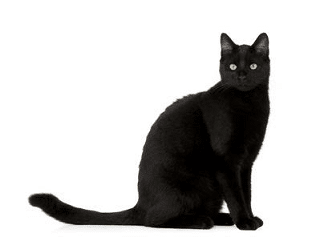 If you are a black cat lover you may want to get to know the Bombay cat. The Bombay cat is a black cat breed. This cat often goes by the nickname “the mini panther”. This is the most awesome black cat breed ever! In France there was a superstition about a magical black cat called matagot. This cat is black and was in many cases considered evil. In other cases the matagot cat could truly bring prosperity if certain rules were followed. You had to lure the cat with a chicken. Once caught the cat was to be placed in a box and carried home. During the journey back home it was extremely important to never look back, not even once. After the black cat was settle in your home, you always had to give the matagot cat the first bit of every single meal. In return the black cat would bring prosperity to its owner. One last thing to remember; release the metagot cat before you grow old or you die in agony. 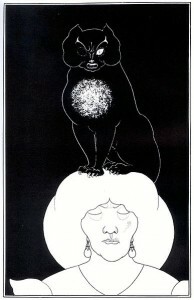 Edgar Allan Poe wrote a famous horror short story called “The Black Cat”. It was published in 1843. The illustration for the story was made by Aubrey Beardsly in 1894. A horror movie named “The Black Cat” was released by Universal Studios in 1934. It became a box office hit. Another horror movie involving a black cat was the movie “Tales of Terror” 1962. The film is based on three of Edgar Allan Poe’s stories. 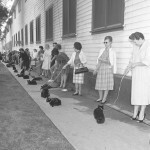 Many black cat owners brought their black cat to the audition hoping to make their black cat a superstar.